PTFE glass cloth is usually offered in 0.25 & <?xml:namespace prefix = st1 ns = "urn:schemas-microsoft-com:office:smarttags" />0.37mm thick. PTFE glass cloth is usually offered in 0.25 & 0.37mm thick. Seamless (endless) PTFE transport belts. Endless woven belts ( also called seamless belt) offer a unique tearing resistance and have no joint and thus no seam. Normally, this belt is custom made belt, making this according to the dimension (width and circumference) , We supply endless woven transport belts made of PTFE coated glass fabric in almost every width and length. 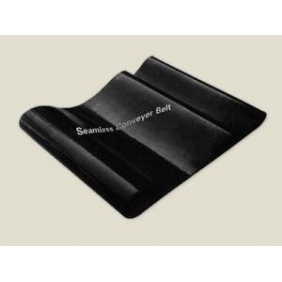 Note: the price is for one Square meter!.Seamless (endless) PTFE belsts is custom made belts. within 7 working days shipped out after receiving the orders. Tell us what you think about PTFE Seamless fusing Belts, share your opinion with other people. Please make sure that your review focus on PTFE Seamless fusing Belts. All the reviews are moderated and will be reviewed within two business days. Inappropriate reviews will not be posted.